The San Diego Gulls will try to rebound from the end of their team-record 15-game standings point streak Monday when they play at Ontario. The loss before a sellout crowd announced at 12,920 on Star Wars Night was the Gulls first in regulation since Dec. 8. The standings point streak was the season’s longest in the American Hockey League and consisted of 10 victories in regulation, one overtime victory, one shootout victory, one overtime loss and two shootout losses. AHL teams receive two points for a victory and one point for an overtime or shootout loss. The Gulls were out-shot 40-19, including a 17-8 disadvantage in the second period. Following a scoreless first period when they were out-shot, 10-3, the Gulls allowed goals eight seconds apart. Joe Gambardella opened the scoring 1:53 into the second period on a two-on-one rush. Luke Esposito scored from the left faceoff circle eight seconds later for his third goal in his 35 games with the Edmonton Oilers AHL affiliate this season and second against the Gulls. The Condors (20-15-2-1) increased their lead to 3-0 on Josh Currie’s power-play goal at 11:02 of the second period, his sixth goal in his last four games. Defenseman Jake Dotchin scored the Gulls first goal with 52 seconds left in the second period, firing a slap shot off Bakersfield defeseman Ryan Stanton and past goaltender Stuart Skinner for his first goal in his 10 games with the team. The Condors regained a three-goal lead 8:22 into the third period when Cooper Marody scored his ninth goal and fourth against the Gulls. Adam Cracknell pulled the Gulls (20-12-2-3) back within two goals 1:17 later when he banked a shot off Skinner for his sixth goal in 12 games with the team. Gambardella got his second goal of the game with 7:20 left. Jake Kulevich scored an empty-net shorthanded goal with 3:26 remaining. Gulls goaltender Kevin Boyle (16-6-1-0) made 34 saves in his first loss in regulation since December 5. He had recorded 11 victories and an overtime loss between regulation losses. Skinner (2-1-0-0) made 17 saves in his first appearance with Bakersfield since being reassigned by Edmonton from the Wichita Thunder of the ECHL Tuesday. The Gulls were scoreless in four power-play opportunities and killed four of Bakersfield’s five. 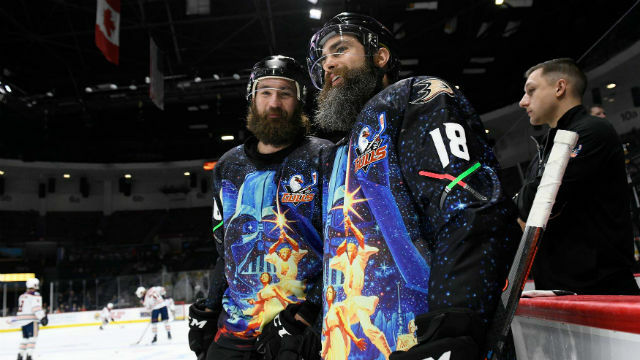 The Gulls wore Star Wars-themed jerseys. Earlier Saturday, the Gulls NHL parent team, the Anaheim Ducks, recalled center Sam Carrick, who leads the team with 20 goals and shares its points lead with 37.